Saturday I made good on my annual Social Capital Inc. offering of a three course meal with wine pairings. In a fun twist, my wife Jodi was the winning bidder this year, thinking the item would be a great wedding gift for our friends John and Liz. She knew they would appreciate a good meal enjoyed with friends! We wound up having a total of seven people sharing this meal. All the guests are quite knowledgeable about wines…that is especially true of Ray & Lori Schaefer, co-owners of Pairings Wine & Food. 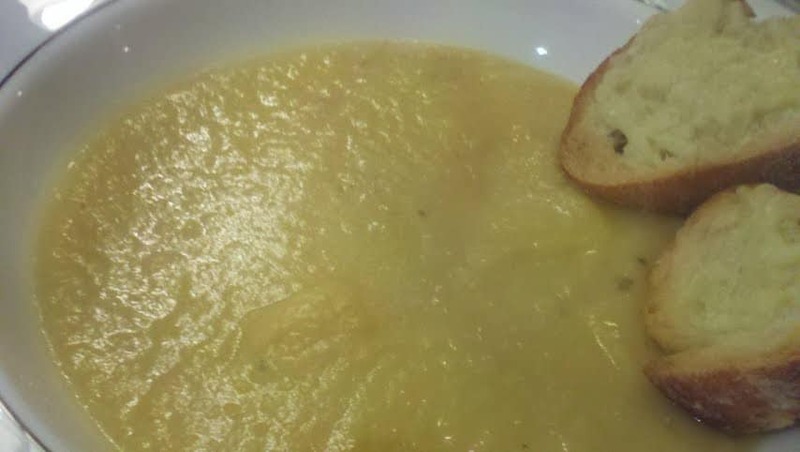 My food and wine pairing posts tend to be very popular, based on the web traffic. So I thought this year I would publish a post on each course. Tonight, Course 1! Food & Wine recommends serving a Pinot Noir with this one, preferably a Burgundy. 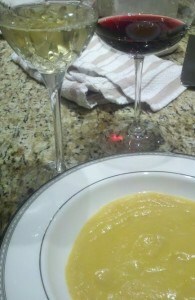 I’ve had the soup at home with pinot several times, and find it to be a winning combination. Knowing our group was very interested in wines, I decided to give people a chance to try more than one wine with each course. The first pinot served was in my estimation the best wine of the night: the 2008 WillaKenzie Pierre Leon Pinot Noir. This elegant wine has plenty of fruitiness but also great depth and structure. This small Oregon producer makes some great wines; I’ve previously extolled the virtues of their Gamay Noir here on Cooking Chat. Probably the best wine I’ve had so far in this new year. After this, we also had a bit of Sean Minor Pinot Noir, which is an excellent value at $20. A couple guests prefer white wine, so I had a white option here as well–which most of us sampled a bit of. 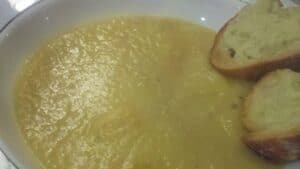 The white Cote du Rhone, the 2006 Domaine Piaugier Sablet Blanc is a blend of Clairette, Roussane and Grenache Blanc is a very good quality wine, and I thought it went pretty well with the soup. 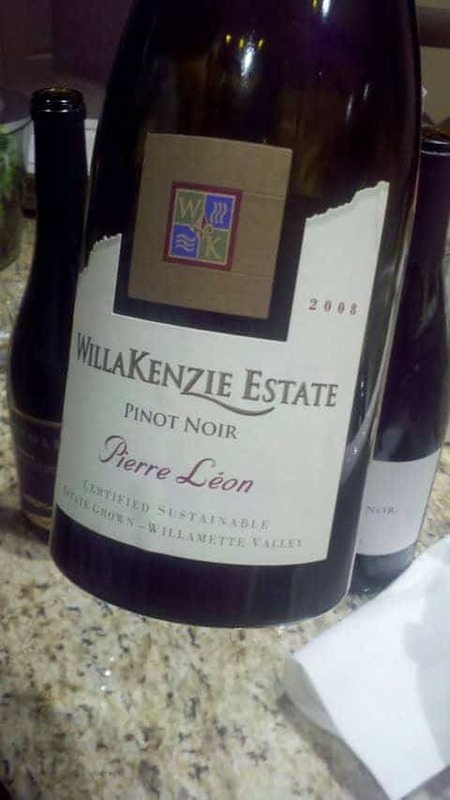 I still prefer the pinot option–I may be influenced by the great quality of the WillaKenzie we served; or maybe I’ve had the pairing enough to have grown accustomed to it. We were definitely off to a good start after this first course (especially after having nibbled on various tasty snacks along with some good wine before we even sat down for the official start of the meal). Stay tuned for course 2!